BRAND NEW IN BOXOE-AUDIO - 10" Amplified subwoofer box - OE-112SANew from OE Audio is the stunning n.. 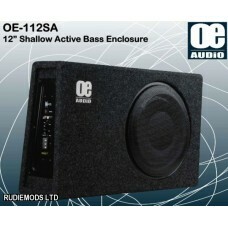 BRAND NEW IN BOXOE-AUDIO - 12" Amplified subwoofer box - OE-112SANew from OE Audio is the stunning n.. Brand NewOE Audio OE-200U 8" Underseat SubwooferFits the following vehicles : BMW 1 Series E81 ..